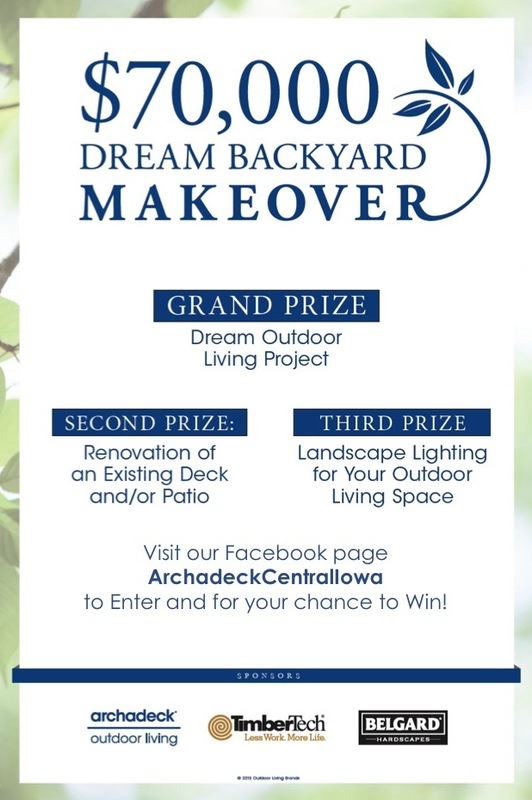 Remember that February 3rd post here about our first-ever Dream Backyard Makeover Contest? 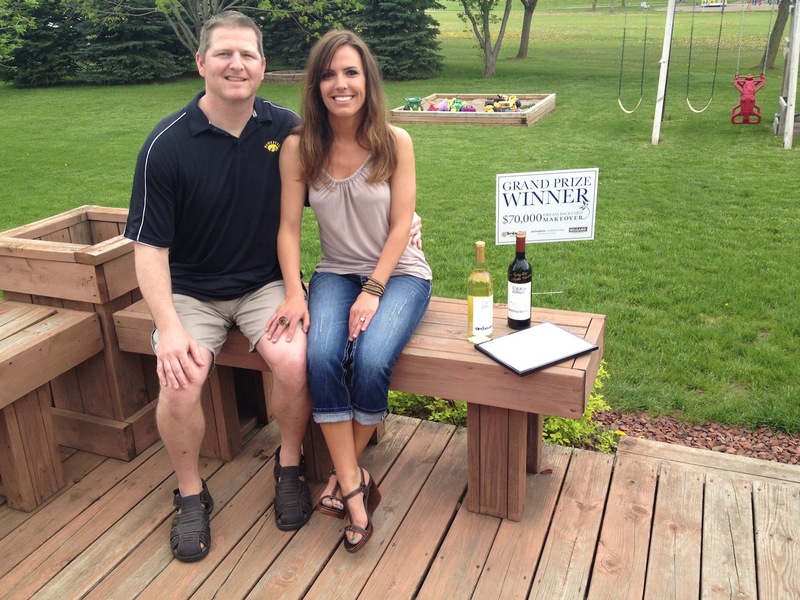 The one with the $70,000 deck and patio combination space Grand Prize? Yeah, that one. The one that Rick and Merea Bentrott of Huxley, Iowa, just won! The one that Archadeck of Central Iowa will now get to design and build for the Bentrott family. This past Friday, May 17th, I got the extreme pleasure of surprising the Bentrott’s with this announcement in the very backyard so in need of the makeover they dreamed of. 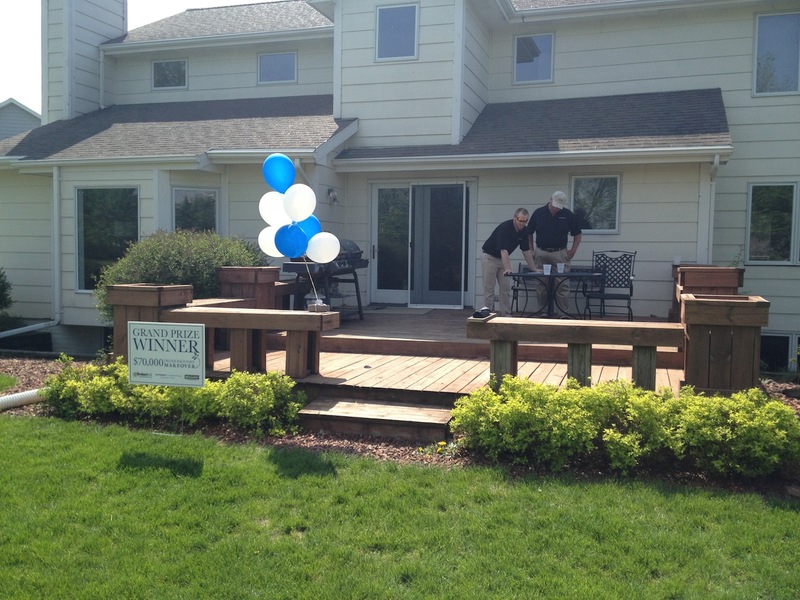 With banners and balloons flying, with cameras rolling, and with a few tears and many smiles flowing… a proclamation was made of the Bentrott’s selection of our Grand Prize package. And its a package the Bentrott’s could really use; with all due respect, their existing deck area is a real mess. Their backyard is very conducive to the deck-patio combination space our contest sponsors, Belgard (patios and hardscaping) and TimberTech (decking and railing) manufacture such high-quality materials for. But, what their new outdoor living space will actually be…that’s where our work comes in now. The Bentrott’s have many good ideas all centered around the concept of having an enjoyable and safe outdoor space in which to share family time, amongst themselves as well as with their friends and neighbors in the Huxley community, just north of Des Moines. To be honest, I don’t have too many ideas about their project yet…whether the Big Green Egg will go on the patio or the deck…whether Rick and the kids get a koi pond, and where it will go if Merea approves…whether Merea gets a hammock, now that she surprised Rick with that one…and whether we can trust Rick not to burn trees down with a fire pit. It’s a lot to comprehend on top of the fact that I’m still in a state of disbelief that a Central Iowa entrant actually won our contest. I can only imagine how the Bentrott’s feel…they are the winners here, not me. Winners…or “Rock Stars” as I call them. 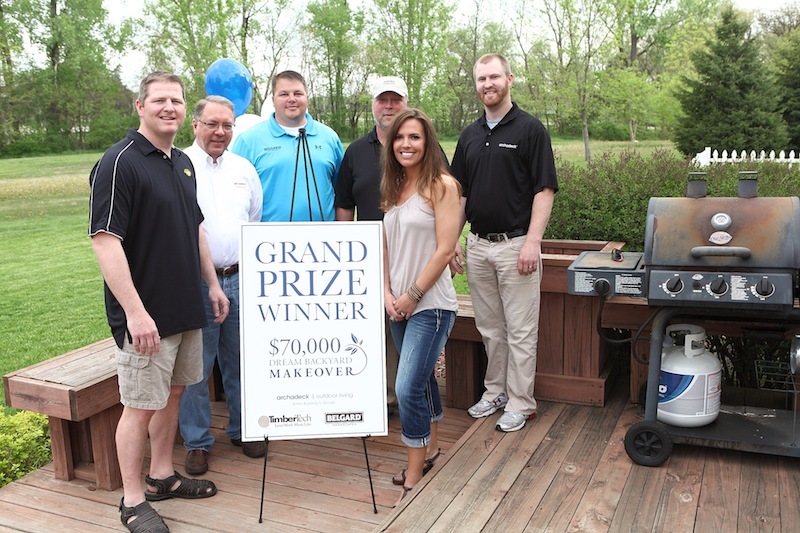 We at Archadeck of Central Iowa are excited to be working with the Bentrott family to bring their Grand Prize, outdoor dream, alive. The ideas and plans will come. We’re scheduling ongoing and future efforts to design and build their new outdoor living spaces. We’ll keep you posted on our progress over the remainder of the summer, so stay connected here to follow the project status. We are also proud to be representing the entire nationwide system of Archadeck outdoor living space designers and builders in this endeavor. 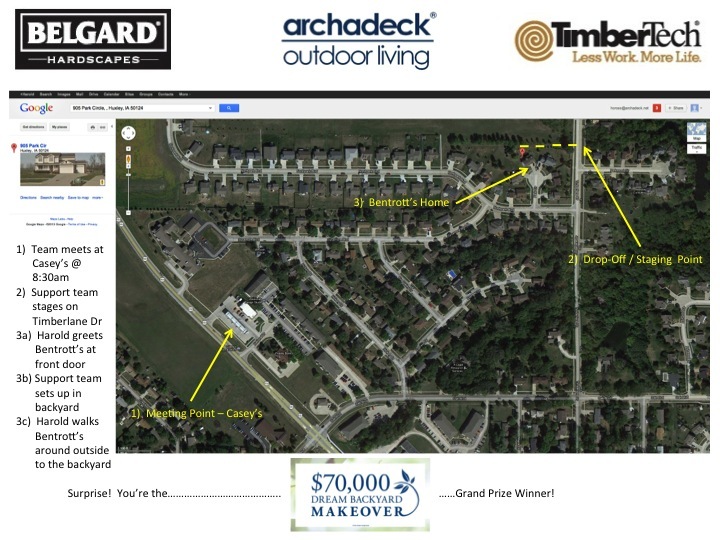 A big thank you to our contest sponsors, Outdoor Living Brands (our Archadeck franchisor), Belgard Hardscapes and TimberTech; without them, none of this would have been possible. We are also proud to be representing our sponsors. Lastly, I want to thank the Bentrott’s neighbors and the Huxley Police for not turning us in and not arresting us for trespassing as we…trespassed…across a couple of adjacent backyards and a city park while setting up the surprise announcement in the Bentrott’s backyard. It was a 3-pronged plan of attack General Patton would be proud of….and not possible to pull off without good troops, which included Chris Boyd (Belgard Territory Manager), David Cross and Nolan Benge (Archadeck of Central Iowa) and Dan Welk (Click! Photography). And pulled it off we did! Archadeck | Outdoor Living. Dream Backyard Makeovers by Design. For nice families like the Bentrott’s. This entry was posted in Deck Lighting, Deck Railings, Decks and Decking, Landscaping, Low-Maintenance Decking, Open Porches, Outdoor Furniture, Outdoor Kitchens, Outdoor Living, Patios, Pergolas, Porches, Screen Porches, Sunrooms, Wood-Plastic Composites and tagged Belgard Hardscapes, decks, patios, TimberTech. Bookmark the permalink.